I first read and loved Stoner by John Williams back in 2010. Not long after that I bought his two other novels in print, Butcher’s Crossing and Augustus. The former is more or less a literary Western (I may have made that up) and the latter is a depiction of Augustan Rome. Whereas Stoner, an academic novel, is well within my reading comfort zone, the other two are well outside of it. That is why it has taken me eight years to get around to Butcher’s Crossing despite having heard from trusted readers that it is a great book. The story centers on Will Andrews, a Harvard boy who decides he wants to head west and participate in a buffalo hunt. It’s unclear what motivated him to leave Cambridge for the western frontier but he quickly sets to bankrolling a buffalo hunt under the direction of grizzled hunter Miller who engages one-handed, drunken, Christian Charley Hoge and skinner Fred Schneider to complete the hunting party. They go off into the mountains of Colorado to find a herd of buffalo the size of which had not been seen in many years. But Miller is convinced it is out there despite the fact that he hasn’t been out that direction for about nine years. What happens when they go looking for that herd is devastating and beautiful. 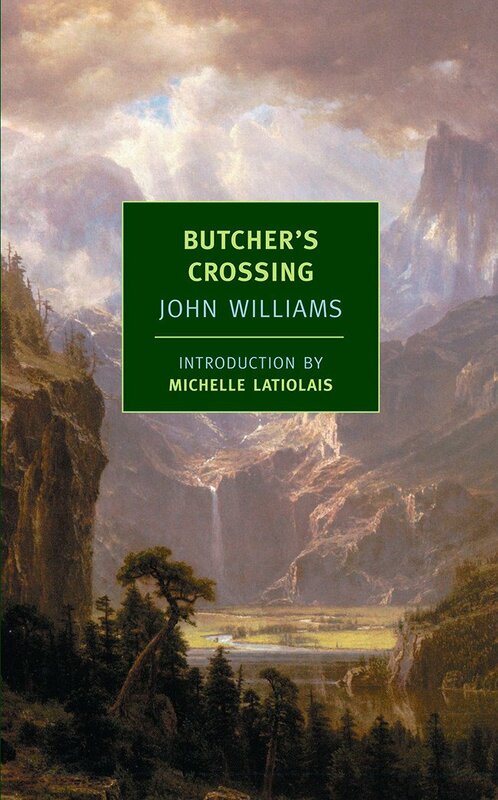 But Butcher’s Crossing is also beautiful because Williams paints a picture of the truly wild west were few humans had trod prior to that time. It is as irresistible as it is hard to imagine, a broad valley in the foothills of the Rockies that is full of buffalo and coyotes with no imprint of humans anywhere. And really fascinating to me, a sky with no planes and no satellites, and the industrializing world at such a distance as to have no impact whatsoever. It reminds me of some of Willa Cather’s descriptions of the southwest, which included the presence of long gone native tribes, but were also evocative of an unimaginable, quiet isolation. The notion of weather and nature and time that has no association with humans. I keep harping on the no humans part because I find the absence of them comforting. And then there is the Jack Londonesque sense of adventure and danger. Some of the things they endured, the ways they coped, and the results (which I will not divulge), are just as unfathomable to me as virgin territory. And like Jack London, John Williams writes well enough about outdoor adventures to draw in even the most committed city slicker. Butcher’s Crossing is one of those novels that proves that good writing and good storytelling can overcome any aversion I may have to a particular topic or genre. So glad you liked this one. I’m just getting into NYRB books (Basic Black with Pearls, which I’m reading now, is really interesting). They’re such classy looking books, and I love the idea of reading re-discovered could-have-been classics. Butcher’s Crossing sounds interesting. I’ll add it to my list. Thanks! So, I guess I really should get around to reading Stoner. Glad to hear you loved this one as much as I did. It’s one of my all-time favorites. The hunting scene is one of the best pieces of writing I’ve read. And the final scenes, when it all comes crashing down, knocked me out. The senseless slaughter of the buffalo is SO INFURIATING — I read The Worst Hard Time by Timothy Egan for a book group a few years ago, and it also covers this horrible subject — American ranchers also wanted to get rid of the buffalo for their grazing cattle which — surprise! — could not survive the harsh winters. And don’t get me started on how they ruined the prairies, which may come back eventually but it’ll take generations. This sounds like a great book, and I love the idea of the unspoiled west, but I don’t know if I can get past the buffalo hunting. If you are interested in literary Westerns, I’d also recommend Angle of Repose by Wallace Stegner, which is wonderful, and Winter Wheat by Mildred Walker. It might be more of a domestic novel set in the west, but it’s excellent and sadly all but ignored nowadays. Sorry to crash your blog, Thomas, but I wanted to add to Karen’s comment that the ranchers are now trying to get the Bureau of Land Management to get rid of (sell to killer buyers or just outright shoot) all the wild horses and burros that they’re required to protect under federal law. The horses are being rounded up so ranchers can graze more cattle and sheep, so the BLM is already acting on behalf of the ranchers. Again, please excuse me, but it’s an issue close to my heart and the more people that protest it, the more likely we are to save the horses and burros. Thanks. I’ve had Stoner on my “get around to list” ever since you read it and talked about it, but this one sounds intriguing to me as well. I’ve been surprised by the (can count them on one hand) westerns that I’ve read and enjoyed. Never mind, the cover of this one is gorgeous.